The entire process was great. From scheduling the appointment, to checking in, x-rays and preliminary exam, and explanationof the treatment plan - everyone was efficient as well as kind. I was really impressed because I felt like I was being treated as a patient AND a person, not just a chart number. The entire process was great. From scheduling the appointment, to checking in, x-rays and preliminary exam, and explanation of the treatment plan - everyone was efficient as wellas kind. I was really impressed because I felt like I was being treated as a patient AND a person, not just a chart number. They were so nice, it was great because I have major anxiety around the dentist. I can not recommend highly enough. Dr. Karami is a graduate of CU School of Dental Medicine. Due to his dedication to patients and peers, upon graduation he received three different awards. 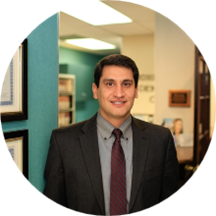 Dr. Karami considers himself a true international Dentist and has been licensed and has practiced dentistry in three different countries. He has been practicing in the Denver area for the past seven years and is a part-time faculty at CU School of dentistry. Dr. Ardavan is very passionate about dentistry and loves to create beautiful smiles for his patients. He consider his goal to provide exemplary dental care to the population of Denver by applying the “Golden Rule” to dentistry, by treating patients the way he wants his family to be treated, with compassion and integrity. In his free time, Dr. Karami loves traveling especially to the beautiful mountains of Colorado and spending time with his family. Replacement crown in 2 appointments. Great job using topical to deaden shot. Almost couldn't feel it. Certainly much better than my memory of fillings from the 1960s ! Today was permanent crown being placed. No need for a shot, almost nopain, just a wee bit when using the air to dry the tooth before applying adhesive. Dr Karami has great hands, he is friendly, knowledgeable, and I trust him completely; you can too ! Doctor Karami is always very friendly and professional. I've been a patient for years, and I've consistently received good service without ever having to wait longer than 5 minutes to be seen. His staff is friendly and professional as well.The two times we've had a billing issue with my insurance company, Dr. Karami and his staff have bent over backwards to put me, as the patient, first and I appreciate that very much. Absoltuely horrible experience with a very rude front desk lady! Dr. Karami was extremely friendly. However, the front desk lady with bad cigarette breath and horrible manners made my overall experience extremely uncomfortable. Great! I always leave knowing what I needed done was done! I’m not one to say that I “enjoy” visits to the dentist, but I actually enjoy my visits here. Dr. K and the team are always super friendly and accommodating. Thank you for always taking care of me! The wait time was about 15 mins. I would like to been seen within 5 mins of my time scheduled but I am sure things happen. I am blessed to have found him he is wonderful. So hey for his wonderful craft I guess I will wait??. Dr.Ardavan karami is very carful and professional.He and his staff respect the patients .i am comfortable with them and i didn’t wait for a long time in his office .i appriciate him and his staff???? Today was my first appointment and I’d have to say he might be the best dentist I’ve seen. He was very nice and made me feel comfortable. I Loved how thorough he was with my cleaning. I haven’t seen a dentistin three years... he made sure to take great care of me even though I was feeling a lot of sensitivity. What I loved most about the visit was how well he explained my X-rays to me and picture taken. I’ve never had a dentist do that with me. I fully understand what was causing my issues and what my treatment will be. The dental assistant was also amazing and so sweet to me! Excited to have my dental work done here! Doctor was giving me options on treatment. Talked me through it and was an intelligent to ask of my choice. Working together never been easier. I always have a great experience when I see Dr. Karami and the staff at Highline Dental. Had a little trouble with the water/suction machine a couple of times so it is a good thing I can tread water! HAHA! It is all good with this practice!! I love them! Everyone was very friendly, helpful, and professional. I hadn't been to a dentist in quite some time, so my anxiety was soaring. I quickly calmed down though, as they all made me feel completely comfortable and cared for. Quick and easy. Removed my temporary crown to get my permanent crown cemented in. This was my second crown in a month. Dr. Karami (and his technicians) always have excellent chairside manner. Looking forward to great dental care in the years to come. Dr. Karami and his dental technician (Julian) make a great team. They are patient-focused (and gentle) and are willing to explain their progress while it is happening. There was no wasted time either in the office lobby or in the dentalchair. I feel as if I am in capable hands with Dr. K and Julian. Dr. A. Karami and his staff are extremely professional and they have excellent bedside manner. I would absolutely recommend this dentist to anyone who will listen! Dr. Karami is very kind, does great work on my teeth, and communicates well. I was very nervous because I have had bad experience at the dentist but he made me feel comfortable and informed. His behavior is very professional and excellent. I never taught I would say that I love coming to the dentist, but I LOVE going to Dr, Karami's Office. As soon as you walk into the office the atmosphere is relaxing and calm, which really helps me due tomy anxiety. The staff is always smiling and cheerful, always willing to answer any question I have. Dr. Karami, is so calm, gentle and cares about his patient and give me the best advice. I LOVE GOING TO DR. KARAMI'S DENTAL OFFICE. THANK YOU JENNIE E.
When I got there I was immediately greeted and offered cold water. Since this was my first time there I had forms to complete. The receptionist, Kim, was really helpful when I called and when it came to the paperwork. OnceI was taken to the back the dental assistant made sure that I was comfortable and took X-rays while we waited for the dentist. Dr. Karami explained things in an easy to understand way and was very gentle. The journey to a perfect smile seems more likely now that I have this team on my side. I’m looking forward to coming back. I was super pleased with my visit. It more than exceeded my expectations. They made me super comfortable. I suffer with TMJ and it's not easy to keep my mouth open for long periods of time, like during the cleanings. Theywere the very 1st dental office to offer me "little bite blocks" to be placed inside my mouth to alleviate the pressure of me having to hold my mouth open the entire time. This helped so much!!! I was so surprised no other dentist had ever given this to me in the past. These guys are far above the rest. I highly recommend going to see them!! Honestly, the visit was very informative and comfortable. Usually for some, a trip to the dentist is dreadful. This place takes all the anxiety away! Or was it the nitrous? ?? I had met Dr. Karami several times before when he would do a brief exam after a cleaning. This was the 1st time I had cavities done. He would give me advance notice of what would be happening next. Very professional and gentle. Best dentist i ever had!!! Excellent svc!! The entire team is EVERYTHING a dental practice should consist of!!! The office environment is welcoming and cozy in a sometimes chilly Colorado. Exactly what I was looking for. AWESOME!. Dr. Karami, is the most caring Dentist I have ever seen and visit. The office staff is very professional and always smiling and greets me when I walk in. Love the inside of the office itself, always clean and freshand don't have that odd smell when you walk in to other dentist office. VERY CLEAN AND FRESH. OUTSTANDING!. I had several teeth receive multiple fillings and after the anesthetic injections I FELT NOTHING. Usually it takes extra for me to avoid pain. This was phenomenal. I also appreciate how the doctor and assistant communicate: utter respect andpoliteness. Thanks to Kim and City in the front office for all their help. I'm very grateful. Friendly staff and knowledgeable dentist. I had 5 cavities filled. New to the Denver area, we made the right choice with Dr. Karami. Excellent dentist; very personable and professional. Relaxing office environment. Reception staff, hygienist and dental technician were welcoming, friendly and efficient.Overall a great experience. I am almost excited to go back, but really who wants to the dentist? As always superb service, care and efficient. A GREAT dentist...he earns hi title! Dr Karami is patient, thorough and gentle. I have visited his office for the past two years and I could not think of a single DDS who comes close to his level of professionalism and patience. Dr. Ardavan Karami is a top-knotch dentist, giving a completely open and honest assessment of diagnoses and treatment, also with excellent, professional and friendly demeanor. He's does very well communicating his medical knowledge, listeningto patient concerns, and is respectful of the patient's own perspective for pursuing any treatment. I am very glad to have switched dentists to now see Dr. Karami, whose office is a far longer drive for me to visit, but worth it! Excellent, friendly and helpful office staff and dental hygienist work also made the visit very smooth and ideal. Many thanks! The staff is very friendly and Dr. Karami is a very patient man! I think i found my primary for the rest of my life. I received such great care from Mr.Karami and the entire staff and would highly recommend that office. Dr. Karami has a wonderfully calming presence and a light, steady hand. He is easy to talk to, thorough in his explanations, and is never rushed. When his attention is on you, you receive his full, undivided attention. I highly recommendhim if you're looking for a dentist or are anything but 100% satisfied with the one you've been seeing. Dr. Karami was great. I really appreciated how he and the staff communicated my treatment plan. Everything was explained in detail from start to finish. Dr. Karami is a top flight Number one First class dentist in every respect. He is talented and committed to providing the best in oral health.